In 1958, Billy Meier predicted the Iraq Wars, AIDS, global warming and terrorism and… he’d already been to the moon. Is it the biggest hoax…or the most important story in human history? 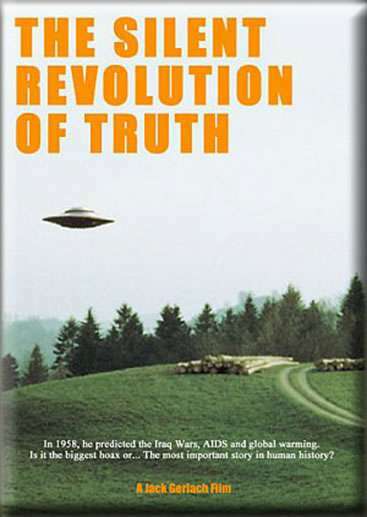 The long awaited, new, feature length documentary on the Billy Meier case is finally here! Now, for the first time, you’ll see and hear Billy Meier’s life story in his own words! • Meier handling the infamous laser pistol! • Multiple UFOs and a UFO hovering…over Meier’s head! • A demonstration of a recent magnetic levitation invention that proves Meier’s UFOs are the real thing! • Scientific examination of the UFO sounds and metal samples! • The apple grown more than 30 years ago…in a Plejaren space ship! • The secret Nazi UFO…used with devastating results against Allied bombers in WWII! • The MGM FX UFO model and Meier’s 60+ words per minute, one-handed typing! • …and never before released Meier UFO photos! • Contacts with the Plejaren, Sfath, which began when he was…five years old! • Conservative parish priest – and UFO contactee – Father Zimmermann, who helped him cope with his otherworldly experience! • Early hardships, youth prison and his escape from the French Foreign Legion! • Travels into the past and future with Asket, from the Dal universe! • Meetings with world leaders from Mahatma Gandhi to…Saddam Hussein! • Role as The Phantom in the Middle East, apprehending serial killers and mass murderers! • Loss of his left arm in a brutal accident in Turkey and the life-threatening delirium that followed! • Dream that saved him from a would be assassin! • The discovery of the Talmud Jmmanuel, the 2,000 year-old document, so heretical it threatens the very foundation of all the major religions! • Who Jmmanuel really was and how the false name “Jesus Christ” was later given to him…with photos of the actual tomb of the crucifixion! • Spiritual teachings – and predictions – from the Plejaren! • Family members sharing what it was like growing up with a UFO contactee! • Numerous other witnesses, including a retired UN diplomat! • Other witnesses, some who also photographed the UFOs! • What a professional therapist has to say about people who say they’ve been in contact with extraterrestrials! • The analysis of Meier’s and the UN diplomat’s honesty by an expert consultant to the U.S. Army Special Forces – who depend on the same observational skills in life and death situations! And there’s more in the Special Features section! • See a professional skeptic take his best shot at Meier’s evidence…and Michael Horn’s rebuttal! • Learn the history of the human race in the universe over millions and millions of years! • Hear the story of how the first interstellar songwriting collaboration took place – and hear the song itself! Once you see this new film you’ll want to have everything available on the Meier case! 1. Origin of Life In the Universe. 2. The Skeptic: Examining the Evidence. 3. DVD-Rom UFO Photo Archive & Screensavers.